Susan Worley - What is this wooden chest with Pye Hill or Pye Bridge printed on the top? 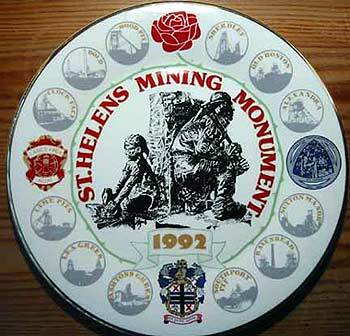 Alan Hughes - Can I Still purchase a St Helens Mining Monument Plate Dated 1992? Neil - Who would be interested in a Smoke Helmet? Rob - Old N.U.M strike badges and memorabilia, are they worth anything? Old N.U.M strike badges and memorabilia, are they worth anything? Hi my dad, like most dads, played his part in the strike of 1984-1985. And he still has a lot of things to do with the strike. He was wandering could they be worth anything. Or do you know of somewhere we can get a price for them. He has things from badges, cups tea towels and plates. I have just looked through my site in more depth, I thought there was a useful link there. Could you advise me please? 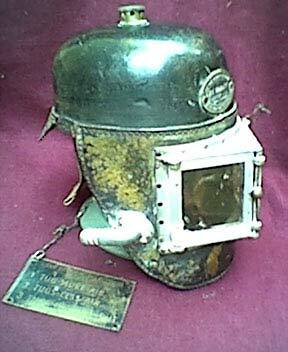 I have a smoke helmet (like the one on your breathing apparatus page) Siebre Gorman, in reasonable condition, who would be interested in this item? Subject: Can I Still purchase a St Helens Mining Monument Plate Dated 1992? Could you please advise me if it is possible to still purchase a St Helens Mining Monument plate as dated 1992.1 worked at Lea Green colliery 1954 - 1962. I have just found your site and wondered if anyone can help I belong to Ifton Meadows Management Committee (I know it is a mouth full) we help to manage one of the old spoil heaps that belonged to Ifton colliery St. Martins, Nr. Oswestry, Shropshire. Last year the meadows which are now a nature reserve was made an LNR. We have been looking for sometime to replace the coal tub that stands at the entrance without any luck does anyone know of a coal tub that needs a good home? What is this wooden chest with Pye Hill or Pye Bridge printed on the top? I have a wooden chest type piece of furniture with Pye Hill or Pye Bridge printed on the top the whole front of the chest opens and there are two shelves inside, could you please tell me what it was used for. I have searched nearly all of the mining sites and cannot trace it. If you can throw any light onto what it is i would be grateful.